If you are considering selling your home, one area you should take a close look at before placing it on the market is the electrical system. A small investment could be the difference between getting top dollar and taking an offer below asking price. Top Flight Electric is a preferred residential electrician serving customers Winter Haven, Lakeland, Eagle Lake and throughout Polk County. Our certified electrical contractors can inspect your home’s electrical system for safety and also identify items that can be upgraded and/or modernized to help add value to your home. Below are some areas we highly recommend hiring a licensed electrical contractor to inspect and/or upgrade before placing your house on the market. A licensed residential electrician can inspect the main power distribution panel for outdated equipment, evidence of overloaded circuits and code violations. 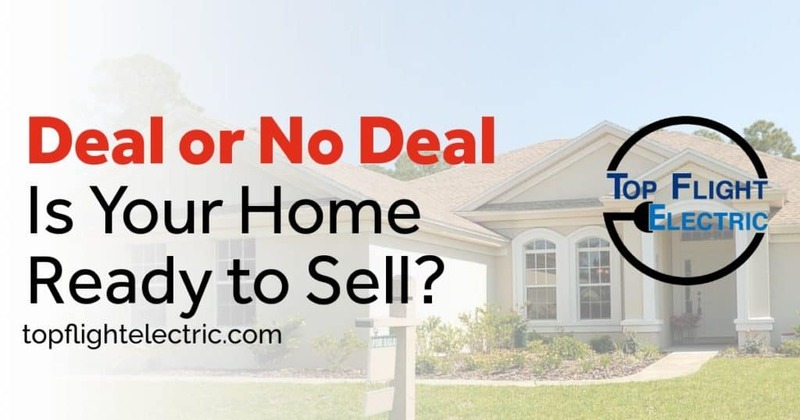 Any one of these issues could cost you a sale and/or result in a lower offer. A qualified electrical contractor can upgrade the main distribution panel with better and safer breakers. This can not only increase the service amperage, but also clean up a rat’s nest of wiring – both of which can make a difference when selling your home. Older homes were not designed or equipped for today’s modern gadgets. Certified electrical contractors can update and install modern wall outlets which have built-in USB charging ports. No more plugging and unplugging lamps, appliances or using unsafe power strips to accommodate your phone, tablet or games. Simply plug devices directly into the USB port in the outlet. This type of upgrade to your home by a licensed electrical contractor can make a huge difference. Top Flight Electric has licensed electrical contractors in Lakeland, Winter Haven, Eagle Lake and throughout Polk County ready to inspect and upgrade your home. Just a few minor changes by a residential electrician could be the difference between getting top dollar for your home or settling for a lower offer. Give us a call today!